← The Reign of Terror – End of term VIRTUAL PERIOD WORK! The next conflict we will focus on now, is the Abyssinian Crisis. As we did with the Manchurian Crisis, we will work on recorded evidence and in this case, we will be able to listen to witnesses of the event and their impressions on what happened. WHAT WAS THE ITALIAN EMPIRE LIKE BY 1930? HOW DID SENATOR GIORGIO PISANO EXPLAIN ITALY’S ATTITUDE FOR CONQUEST? WHAT IS ABYSSINIA TODAY? WHAT WAS THE SITUATION BY 1930? WHAT EXCUSE DID MUSSOLINI HAVE TO CONQUER ABYSSINIA? WHAT WAS THE ROLE OF FRANCE AND GREAT BRITAIN IN ITALY’S INVASION? WHAT EVIDENCE DOES MUSSOLINI’S DAUGHTER PROVIDE? WHAT DID YOUNG SOLDIERS BELIEVE WAS THEIR DUTY TOWARDS ITALY? 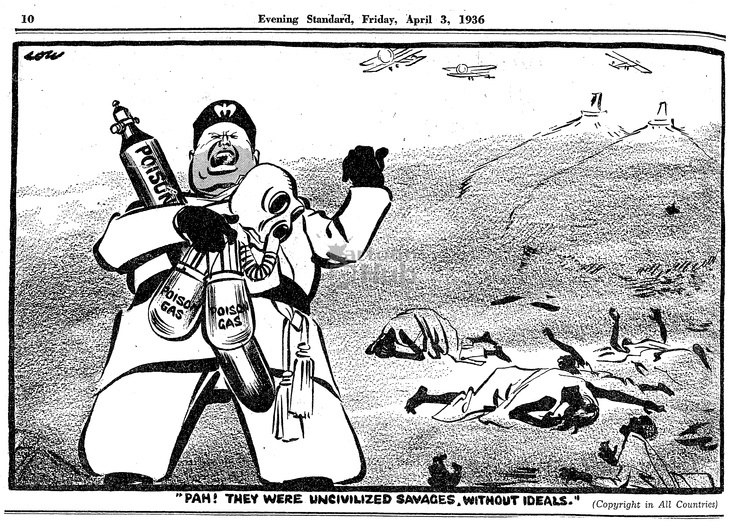 WHAT WAS CONTROVERSIAL ABOUT THE USE OF POISON GAS BY THE ITALIANS? WHAT DID THE LEAGUE DECIDE TO DO? HOW EFFECTIVE WERE THOSE MEASURES? HOW DID ORDINARY PEOPLE REACTO TO SANCTIONS? This entry was posted in HISTORY S2 2016, HISTORY S3 2015. Bookmark the permalink.